• 1100 sqft , 2 bath , 2 bdrm single story – FOR SALE USD220,000 . Better-priced than other condos nearby! This condo for sale in Tulum is very private, with the main terrace off the pool and more towards the street with a privacy wall between that terrace and the street. The deck has been extended for a very usable patio size, and also a walk-out space was added to one of the bedrooms so it also has direct access to that terrace. * Fully-equipped kitchen with kitchen island. 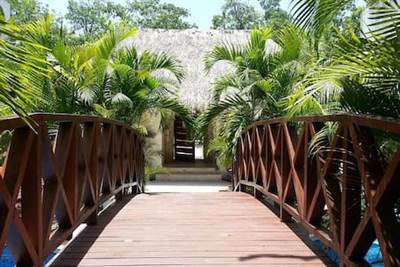 This large ground-floor condo for sale in Tulum has a great rental history, making it a fantastic investment opportunity for those looking for a profitable second home.